Is Facebook a mystery to you? But with that struggle comes a huge opportunity. No matter the industry you’re in, you can use Facebook to grow your business. After all, nearly all people use Facebook. In America alone, 79% of Internet users have a Facebook account. Your potential customers are there, you just need to reach them. The purpose of this guide is to walk you through using Facebook as a marketing tool, step-by-step. Create Facebook ads that produce significant return on investment (ROI). If you already know the basics, you’ll be able to fly through. Which Ad Placements Are Best? Are You a Facebook Expert Now? 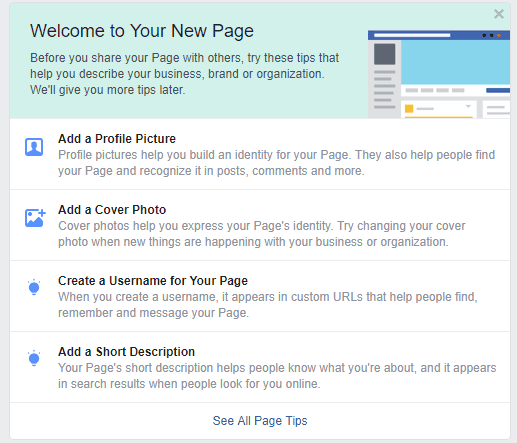 In order to use Facebook for your business, you’ll need to create a business page. It’s not complicated. I’ll walk you through the essentials. First, you’ll need a personal Facebook account. 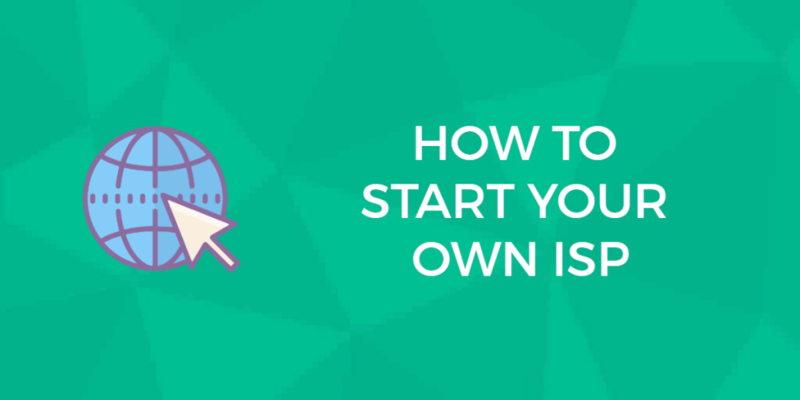 If you don’t already have one, create one now. Local business or place: Choose this if you have a brick-and-mortar location. Company, organization or institution: This is the generic, most common option for a small business. Brand or product: Not common, but good if you have a single product that people are huge fans of. You’ll create a very similar page no matter which option you choose. That creates a skeleton of a page that you can customize. The nice thing is that Facebook tells you the most important things that you need to do to make your page look great. Start by adding a cover photo, which should be roughly 820 pixels wide and 312 pixels tall. 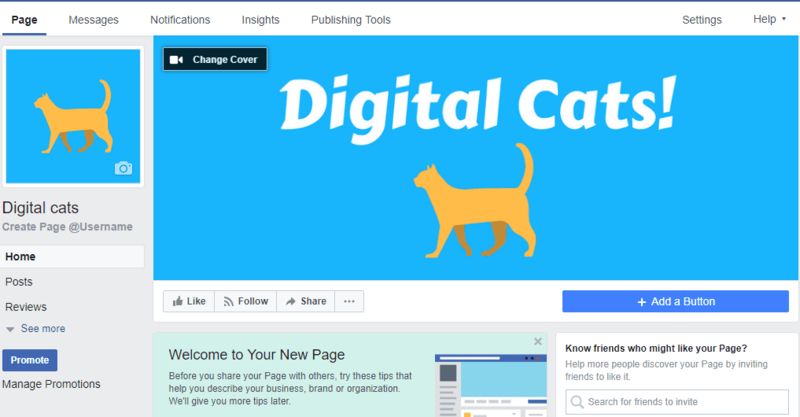 Here’s a free guide to creating a cover photo plus a cover creator tool you can use. Next, upload a profile picture. This will show up in all your posts in the top left corner, which makes it very important. Using a picture of a person is best if possible, but a logo is okay if not. It should be a square sized at 170 pixels by 170 pixels or smaller. Your page will look a lot better already. Next, click “create username” underneath your profile picture, and type in a username. 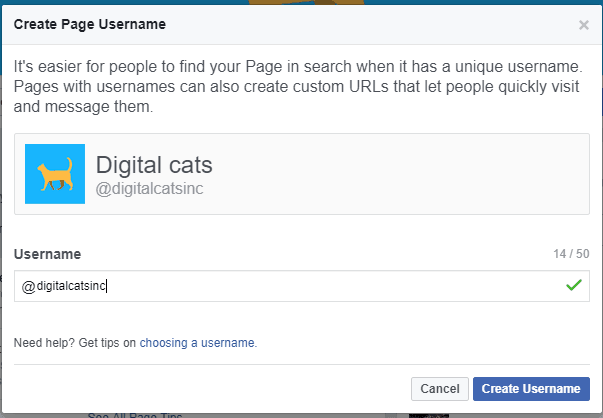 This will make it easier to link to your Facebook page from your website or anywhere else. 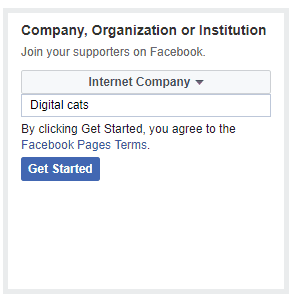 If your ideal name isn’t available, add something like “inc” or “page” to the end. Finally, create a description for your page. It’s the last recommendation that Facebook gives you. This description shows up in the About tab of your page. Beyond the basics, there are a few changes you can make to your page to ultimately drive more sales to your business. First, you can add a custom button right under your cover photo. 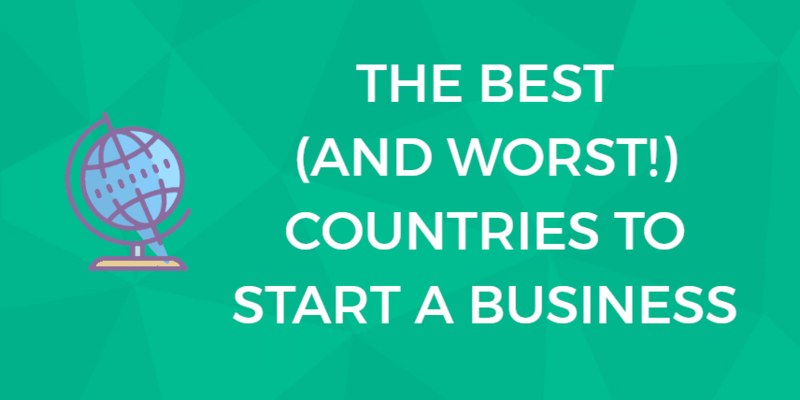 Have a look through the different options to pick the best one for your business, whether it’s to download an app right away, or contact your support. Once you choose one, you’ll have to input a link where someone can actually take that action on your website. The second main tweak you can make is to customize the tabs on the left side of your page. It’s a bit tricky to find this option. First, click on “settings” near the top right of your page, and then choose “edit page” in your settings menu. You can drag and drop existing tabs to reorder them on the page. Additionally, you can click on “add a tab” to add a new one. 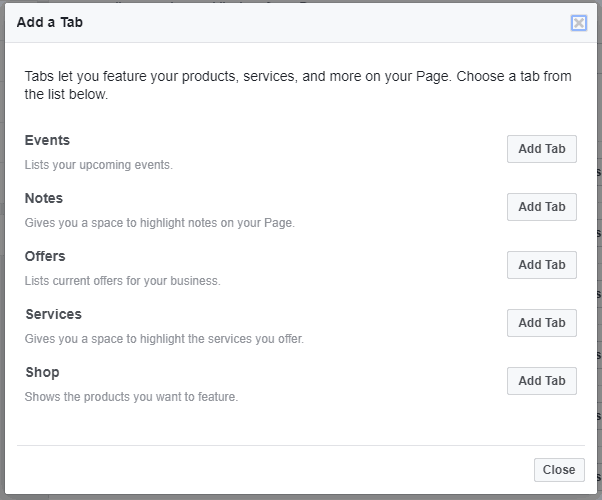 You can create a tab for custom offers or even create a mini store on your Facebook page. Once you click “add tab,” it will be added if you go back to your page. For most tabs, you’ll need to configure them by going to the tab itself and then following the prompts. One of the main purposes of having a Facebook page is to make posts that people who “like” the page will see. When those people interact with your posts, their friends may also see your posts and learn about your business and product. You can choose from different post types along the top, but typically you’ll want to stick to either “photo/video” posts. Look at a few of your favorite companies to get a feel for what your posts should look like. If you don’t have some sort of image or video in your post, it won’t grab anyone’s attention. as opposed to posting a YouTube link. The Facebook algorithm favors video uploads. 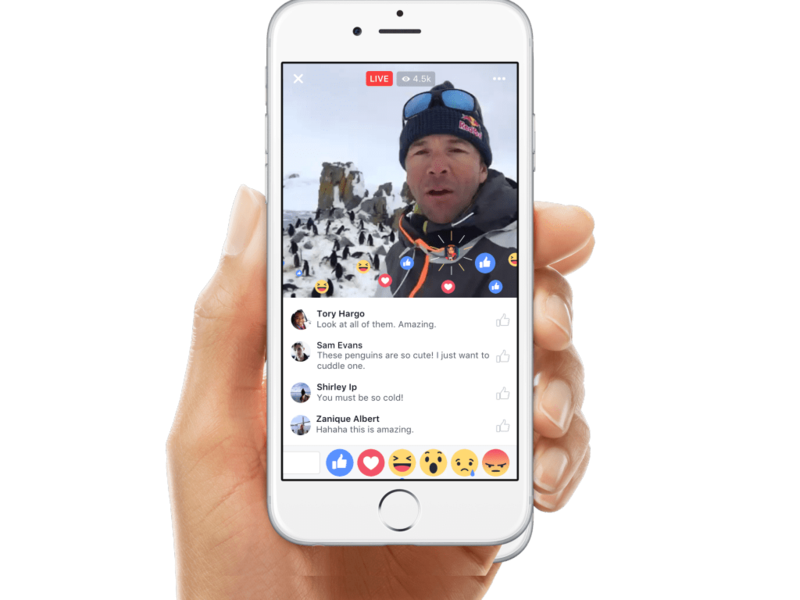 When you get Facebook basics down you may want to explore new forms of engagement like live video. Your users will be able to comment and post emoticon reactions in real time. When Facebook first introduced business and organization Pages, all of the users that “liked” your page would see all of your posts. Now, there are far too many things competing for space, so Facebook only shows your posts to a small portion of your followers (at least initially). That’s where “EdgeRank” comes in. EdgeRank is the algorithm used to predict how much a user will like a post that could show up in his or her feed. Facebook shows the posts with the highest scores. Time decay – new posts are valued higher than old posts. Understanding EdgeRank allows you to tailor your posts to score higher and get more visibility among your fans. Creating contests where fans get entries from liking and sharing the post (which helps you reach a wider audience as well). 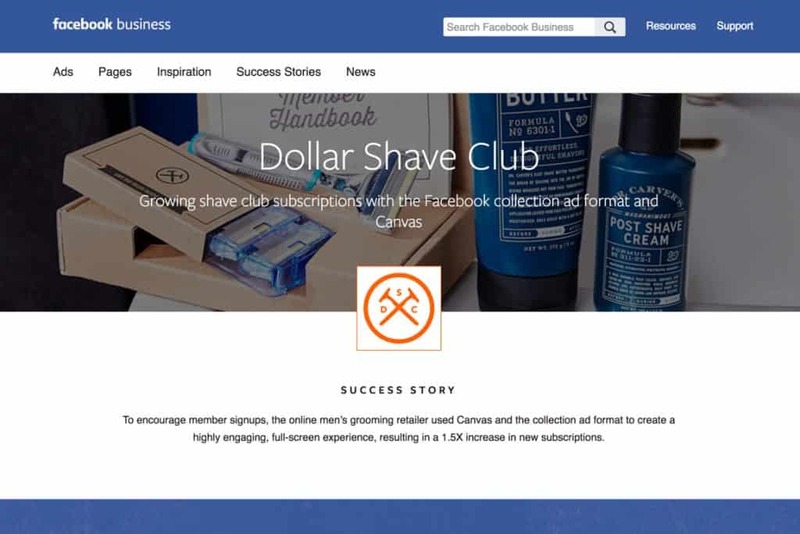 Get ideas for Facebook posts by browsing other business pages. 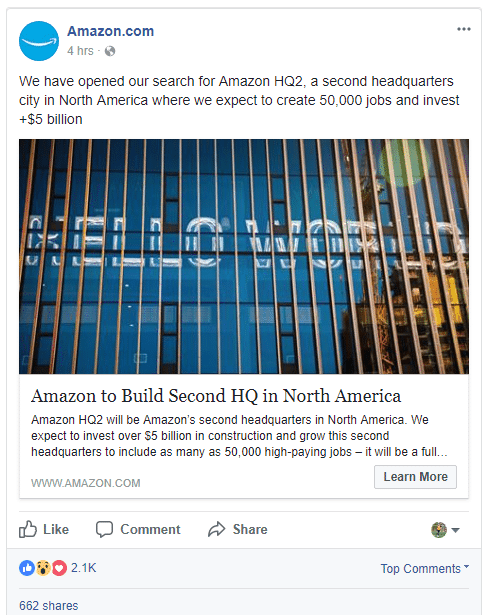 This post is from the Facebook Business Page, which often features glimpses into how small businesses are using Facebook. 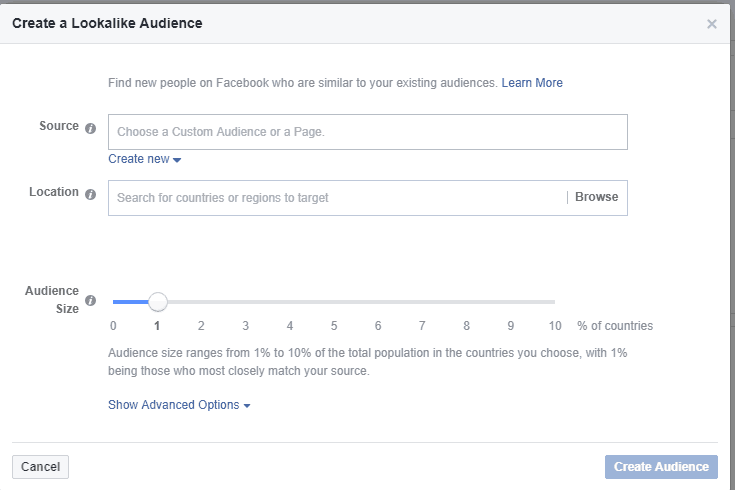 Facebook analytics will change the way you understand your users. And so much more. 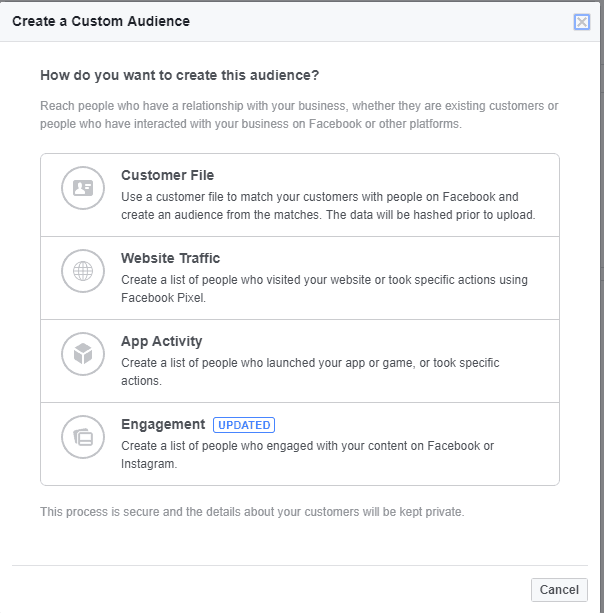 You can install pixels (small pieces of code) on your website to continue tracking which specific Facebook users actually convert to customers. This will impact your marketing as a whole, not just on Facebook. 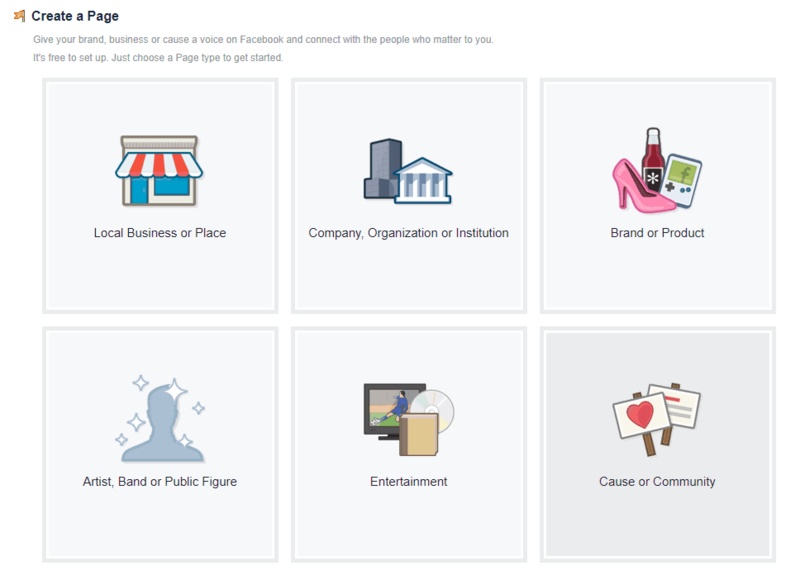 To get even more data, you can go to your Facebook business page and click “insights” along the top. This will give you more demographic data, but also data on the posts you’ve made. After you’ve made several posts, analyze them and see if certain types of posts — or certain topics — have higher engagement. If so, start posting more about those topics. Here’s an in-depth guide to using insights data. The other side of Facebook is Facebook advertising. If you try to grow a page purely through organic posting and interaction, it will be painfully slow. It was possible in the past, but these days, organic is not enough. With any advertising, there is a cost. Facebook ads are certainly cheaper than Adwords, but their price continues to rise. The ads help you expand the reach of your page’s posts, but in order to get a reasonable cost per click (CPC), your posts need to get liked, shared, and commented as much as possible. Your first step is to pick an objective. 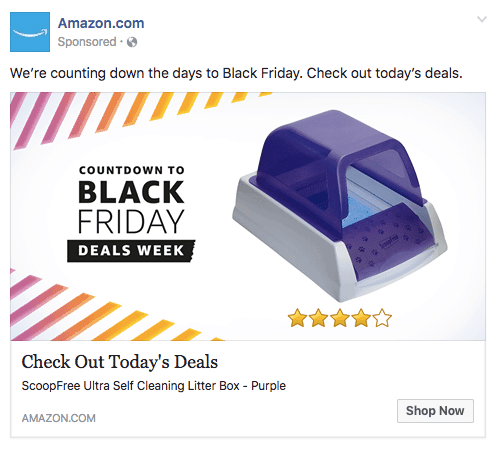 Engagement: This is how you “boost” posts; you pay based on post likes, comments, and shares. Conversions: This tracks which clicks actually result in sales and optimizes for this type of user. Traffic: This choice prioritizes driving traffic to a landing page on your website. Pick the gender, language, location, and interests that you’d like to target. You want to pick a fairly specific audience to really nail down your message. Aim for 10,000-50,000 users in your audience. Finally, you should change the ad placement default settings. You’ll typically want to uncheck showing the ad on Instagram. If you decide to only show to desktop users or to mobile users later, you will change it here. The short answer is, you won’t know until you try. Or you might find that sidebar ads do. Ideally, run all types of ads for a few days, and then eliminate any placements that are underperforming. 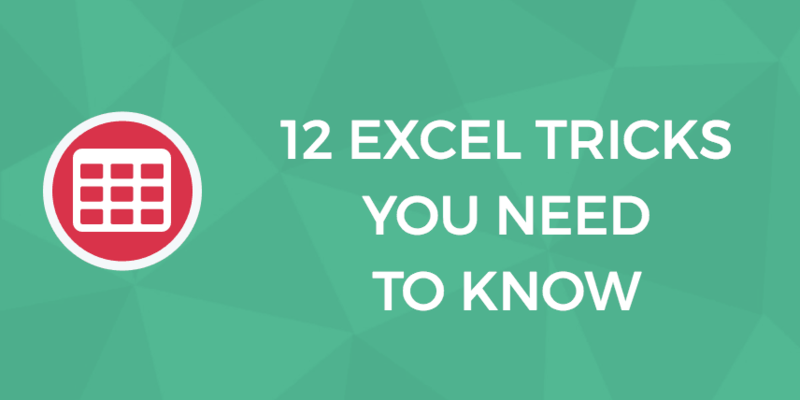 You’ve probably heard stories of businesses getting 200% ROI or more. They are able to achieve those results through retargeting and custom audiences. The basic idea is that if someone engages with your content and goes to your website, they’re probably going to engage with your ads again in the future. Retargeting lets you track these users and target them specifically, resulting in really high levels of engagement (and cheaper clicks). 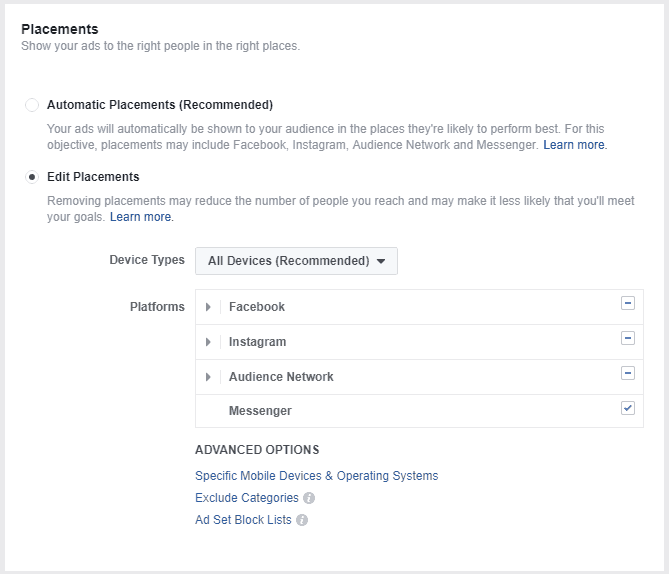 Go into your Facebook ads manager, and click the navigation menu in the top left. You’ll see an option for “audiences.” Click it. 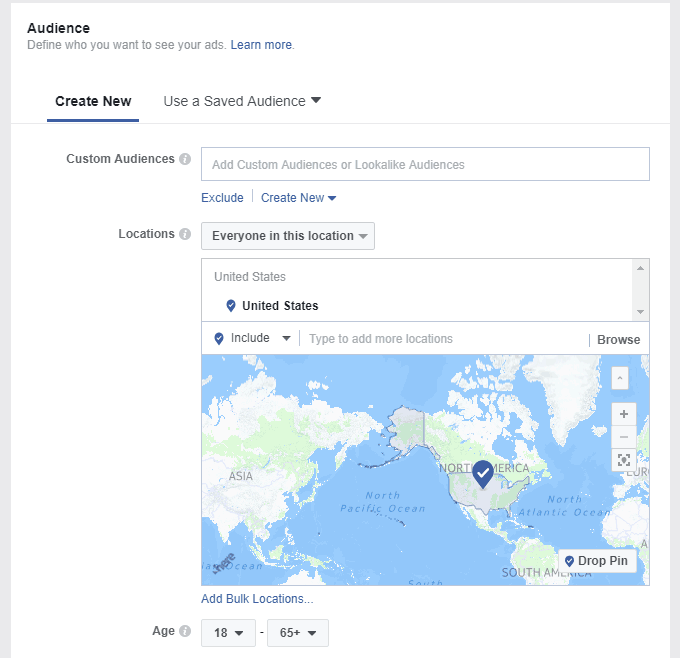 Creating any of these audiences and targeting them with ads will yield far better results than typical targeting through interests and demographics. If you have the email addresses of at least 100 customers, you can upload those and Facebook will find people that are most similar to them. Here is a complete guide to Facebook retargeting that walks you through the technical steps. 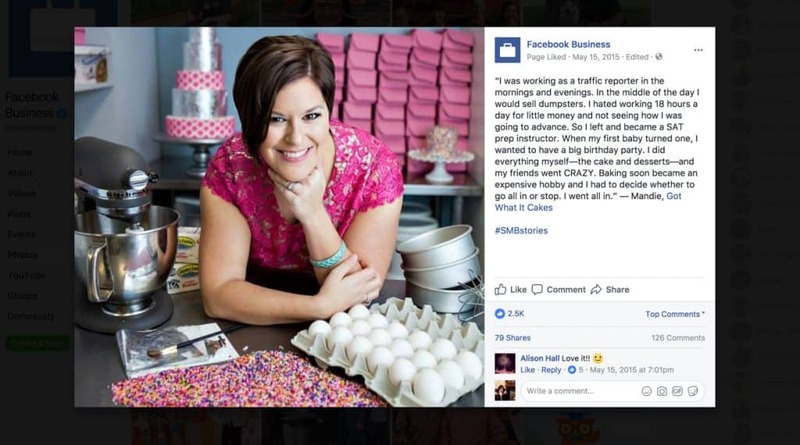 Once you’ve mastered the tips in this guide try exploring success stories of small businesses using Facebook. You’ll find these on Facebook, on the “Facebook Business” page. You might not be an expert, but you should have a solid grasp on the basics of using Facebook effectively for your business. As you actually start implementing everything in this guide, you can then search for more in-depth, technical guides if you run into any problems. Keep in mind that there’s a steep learning curve. You likely won’t get great results right away, but they will get better as you learn which tactics work best for your business.